The film is an animated science fiction story based on the Japanese comic book character ‘Astro Boy.’ The look is futuristic with elements of a ‘Jetsons World’— space cars and neon sky scrapers are the setting in Metro City (a large cloud that hovers above the trash filled planet Earth). I’m not sure how American audiences will react to Astro Boy as his character isn’t well known here. The idea behind Astro Boy (voiced by Freddie Highmore) is somewhat similar to that of Pinocchio; although Astro Boy is based on a real boy named Toby. When Toby dies in a freak accident right before his Dad (voiced by Nic Cage) can save him, a distraught Dad, makes a new boy; using Toby’s DNA which he’s gathered from a lock of the boy’s hair. The boy is made out of machine parts and operates by the use of a glowing substance called ‘Blue Core’ which is housed in his chest in a wooden chamber behind a door. The new robot boy has super powers. He can fly, has incredible strength, x-ray vision and has machine guns hidden in his hands and other parts of his body. Basically, he’s a robot with the heart and emotion of a real boy, same as in the story of Pinocchio. Too bad Toby’s dad doesn’t feel the love as Geppetto did for his new son. Toby’s father becomes frustrated with his new son and tells him, in a very mean voice, “You are not my son, you are a machine.” His next line is shocking and I quote, “I don’t want you anymore.” Yes, that is an actual quote from the screening I attended and in the next scene, Dad hurries to try and kill his new robot son. A very sad boy is pleading with his dad to not destroy him and asks repeatedly what he did wrong. Come on! This is one of the worst so called children’s film scripts I’ve viewed so far. Next, we view a frantic darling little robot boy running for his life. 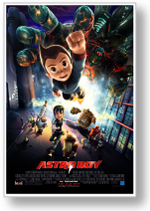 The remainder of the film centers on Astro Boy’s sadness and search for a sense of family as well as acceptance by others. I found these themes to be the main problem with the film. The film progresses from bad to worse. As robot Toby is running for his life, the Metro police are called out to capture him. These over-sized goons are in flying tanks with machine guns and high-tech weapons. It’s an all out war on little robot Toby. Luckily, Toby escapes to good old planet Earth and finds a gang of kids that accept him for the moment as he keeps his (machine identity) a secret. These kids name him Astro Boy and at last, Toby feels at home— but this is short lived. The kids gather broken down machine parts that are to be given to Ham Egg, (voiced by Nathan Lane) a Fagian shady character clone from Dickens’Oliver Twist who loathes machines and comments about how they have no feelings and are worthless. One senses that Ham Egg is a really bad dude, but that is not revealed until later when we discover that the parts that the kids find are reconditioned to make new machines that fight to the death in a gladiator-type arena as rowdy crowds cheer. Of course, Ham Egg discovers that Astro Boy is a machine and forces him to fight the biggest of all the machines. Although this scene isn’t violent enough for the writers, he’s next pitted against four huge, black, scary-looking machines at once. I’m not going to give away the ending, but I am going to tell you that this film is not suitable for children. I’m not sure who the intended audience is as I obviously had a bad reaction to the film. The animation and special effects are eye-popping, but that doesn’t excuse the poor quality of the script.